(Phys.org) —In February two Iberian lynx females who belong to the Iberian lynx Conservation Breeding Program (ILCBPS) were castrated in order to guarantee a better quality of life and prevent possible health problems. Scientist from the Leibniz Institute for Zoo and Wildlife Research IZW, Berlin, Germany, went to the breeding centers in Spain and Portugal to obtain embryos by flushing the oviducts and freeze ovarian tissue immediately after surgery. The obtained embryos and ovarian pieces are stored in liquid nitrogen. Now they are kept at the Museo Nacional de Ciencias Naturales de Madrid (CSIC) for further usage in the breeding programme. The specialists of the IZW performed a pioneering procedure to obtain and freeze embryos in a wildlife species. Based on their experience in the domestic cat, they developed a method for cryopreserving oocytes and embryos of wild cat species. "Seven days after mating we expected to flush embryos from the uterus. In both cases, however, oocytes and embryos were still within the oviducts. Thus, the embryo development in lynxes is slower than in domestic cats", says Prof Katarina Jewgenow from the IZW specialist team. 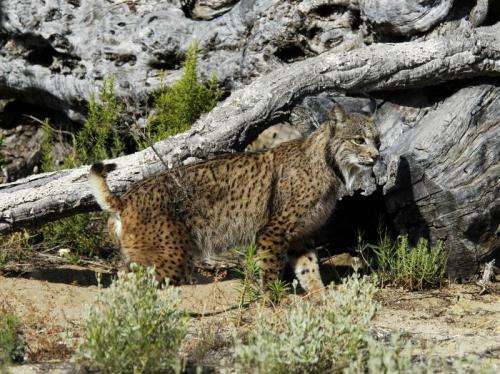 During two consecutive breeding seasons, "Azahar", a female lynx from the Centro Nacional de Reprodução de Lince Ibérico in Silves, Portugal, experienced problems during parturition and an emergency caesarean operation was required in each case. The Iberian Lynx Conservation Breeding Program recommended not to breed "Azahar" again. In this situation it was decided to try to preserve her genetic material by collecting embryos and freezing the ovarian cortex after removing ovaries by castration. The IZW team preserved three embryos and the ovarian cortex. "The next step we are discussing right now is to implant these embryos into a foster mother, which might be an Eurasian lynx female", comments Jewgenow. "Saliega", the other female, is located in the Centro de Cría de el Acebuche, in Doñana, Spain. "Saliega" was the first Iberian lynx who was bred in captivity in 2005. In July 2012 she suffered from a mammary tumor after lactating her current litter. The risk of mammary tumor recidivism, her advanced age (12 years) and the fact that she already gave birth to 16 cubs during the last 8 years was the basis for the decision to castrate her as well. "From her we only flushed unfertilised eggs, thus the male was not fertile", said Natalia Mikolaewska, a doctoral student from the IZW. "Her genetic material in terms of ovarian cortex oocytes was frozen as well", comments Natalia. The Iberian lynx is the only wild cat species listed on the IUCN Red List as critically endangered. A decade ago, less than 200 individuals were left. The remaining population is located in southern Spain.